I am an artist, midwife and mom. For a long time I couldn't make art because I felt overwhelmed by the formal requirements of design, subject and perspective. I hated drawing, and could never figure what I was going to paint, like it had to be a thing. Then I accepted that my brain processes in shape and color, not lines, and the stress dissipated. I started by blending and spreading layers of cheap paint across used canvases from Goodwill, then digging back through them with water and knives to build contrast. Eventually I became more confident and moved onto hardboards and M. Graham acrylics, but the process remains much the same. 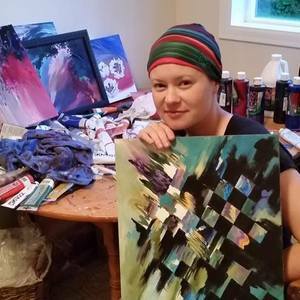 As I discovered my art I battled my depression. I state this, not to garner sympathy, but to spread awareness. Depression is a physiologic disease, like diabetes. Like cancer. It is caused by an imbalance of neurochemicals in the brain. It is not imagined nor is it divine punishment for sins or lack of faith. There are evidence-based medical treatments for depression just like for any illness, but bodies vary widely and it takes time and commitment to determine what will work for any given person. It seems obvious now, but it took me years to figure out that when I didn't want to live, I didn't want to paint. The color was just gone. I think that some artists create in order to move through their anguish, or to understand it. I am able to paint only when I'm free of it, and lately I've painted every day. Every time I close my eyes I see something amazing and colorful that I want others to see as well. My paintings are my testament to healing and self-forgiveness. They are an invitation to defy the rules. They are a peek into my healthy, happy soul, and the pain that I have come back from.